According to the World Health Organisation, over 60% of the world’s population has no access to ultrasound imaging for medical diagnosis. We're working to lower that statistic. From the jungles of Panama to the mountains of Nepal, our Global Health Programme helps clinicians bring portable ultrasound to patients and institutions that don't have access to medical imaging due to social conditions, remote locations, or lack of funds. We've created two programmes for healthcare professionals who want to bring ultrasound to the point of patient care. Read more to understand the difference between our SoundCaring Programme and our SonoSite Global Loaner Programme, then apply online or contact us to get involved. SonoSite's SoundCaring Programme helps qualified medical organisations purchase new or refurbished portable ultrasound systems at a discounted price. Learn how to purchase discounted ultrasound equipment. 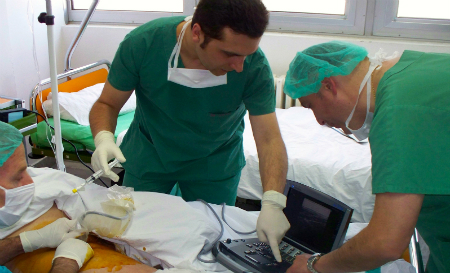 SonoSite's Global Loan Programme loans ultrasound equipment to U.S. based medical professionals working with non-profit organisations. Learn how to apply to borrow ultrasound equipment. The clinicians that bring ultrasound to the point-of-patient care are our greatest source of inspiration. Visit the SonoSite blog to find the global health stories that are a testament to them and their journeys. "Occasionally, some doctors will encounter a situation for which they are not equipped or experienced in. The distances and lack of transport in these places makes fast and accurate diagnosis critical in order to expedite appropriate patient management. It’s easy to see how useful a portable ultrasound machine in the hands of a competent technician will be in this setting." - Ingrid Yuile, Locum Sonographer, Perrycoe Health in "User Stories: Taking Ultrasound to Mongolia"